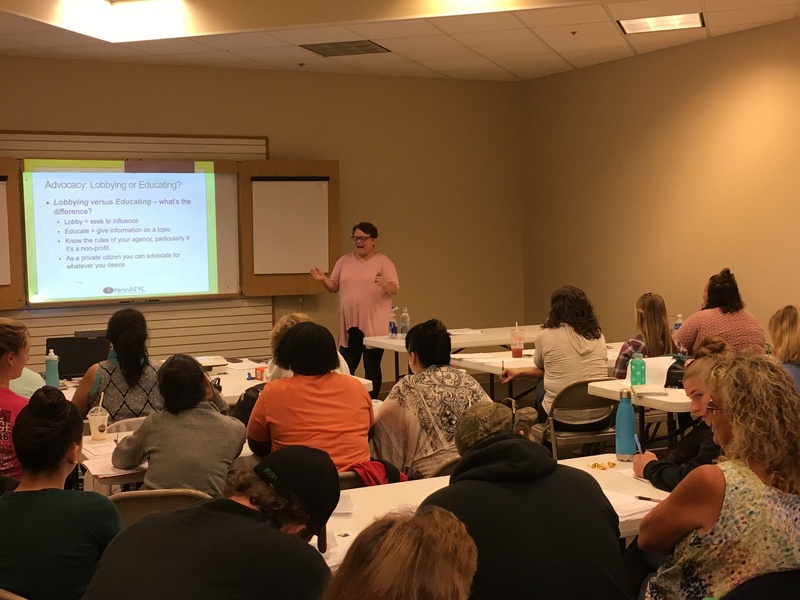 PennAEYC is committed to the professional growth and development of early care and education professionals in Pennsylvania. Our work is grounded in the belief that all professionals deserve access to professional development that honors their current knowledge and experiences while challenging them to use a new lens as they experience both familiar and new materials rooted in developmentally appropriate practices for young children. PennAEYC offers a variety of professional development topics delivered by experienced and engaging staff who share information based on the most current research and classroom implementation strategies. See a full list of the current professional development offered by PennAEYC. Registration for our professional development can be done through the PA Keys Professional Development Registry. Search PennAEYC on the PA Keys Registry calendar to find scheduled events in your area. Events can be scheduled as private fee for services events by contacting PennAEYC Director of Member and Educational Services, Rose Snyder. PennAEYC can offer support and consultation in the development of a PD plan designed to meet your program and staff needs.